After sales of the all-new sixth-generation Chevrolet Camaro tumbled 17% in Canada in the first-half of 2016, praises be, Camaro volume jumped 27% to 307 units in July 2016. Granted, the Ford Mustang is way more popular for any number of reasons. 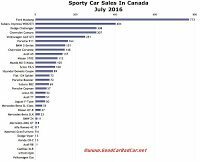 But we didn’t expect the Camaro to outsell the Mustang in Canada anytime soon, if ever. The Dodge Challenger, on the other hand? Even in a much-improved month for the Camaro, the Chevrolet still came up one sale shy of the Challenger, sales of which rose 67% in July. Incidentally, through the first seven months of 2016, Dodge Challenger sales are up precisely 11.3%, year-over-year. 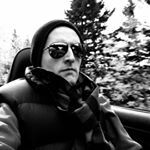 Canadian sales of the Chevrolet Camaro are down precisely 11.3%. Total Ford Mustang sales are 1479-units stronger than the Chevrolet and Dodge combined. After rising to an eight-year Canadian sales high in 2015, Ford is on track for an improved finish of 7800 Canadian Mustang sales in 2016. 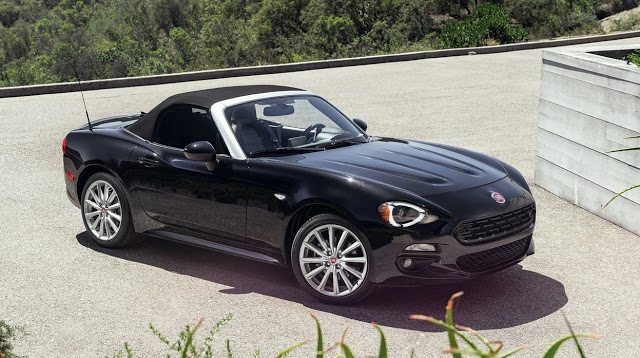 July was also worthy of note because of the Canadian arrival of the Fiat 124 Spider, a fraternal twin of the Mazda MX-5 Miata. In its first abbreviated month on the market, Fiat sold 72 copies of the 124 Spider. Sales of the MX-5, which we reviewed last month, jumped 35% to 105 units. GCBC isn’t here to break down segments, an impossible task for any group, but to display sales data for the sake of comparison. The more ways sales data can be displayed, the better. This explains why you’ll see the Audi A5 here and with luxury cars, because readers have wanted it both ways. You can always find the sales results for EVERY vehicle and form your own competitive sets by using the All Vehicle Rankings posts. 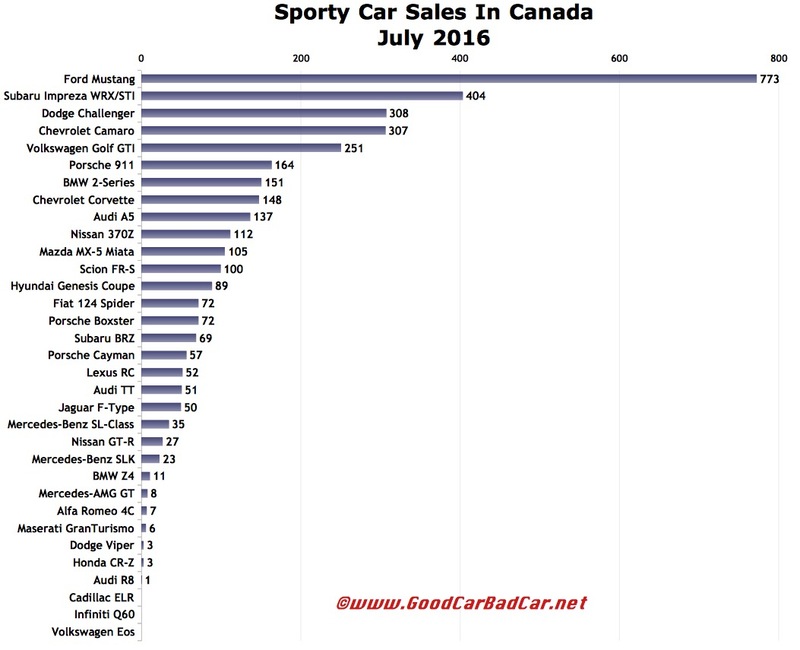 Clearly GoodCarBadCar is not suggesting that the cars in the tables above are all direct competitors. Establishing categories among cars as unique as even the Audi TT and Porsche Boxster has never pleased a single reader, so cars have been lumped together so you can simply see how buyers looking for sports cars, roadsters, hot hatches, convertibles, GTs, and wanna-be sports cars spend their money. Greater categorization of cars would only lead to problems that automakers create by not isolating model-specific sales figures: we don’t know how many M3s BMW has sold or how many Civics are Si models, for example. The numbers we do have are listed above. GoodCarBadCar is always open to hearing about the ways you would break down segments, so feel free to get in touch. We do not yet have year-to-date sales info for the Maserati GranTurismo.